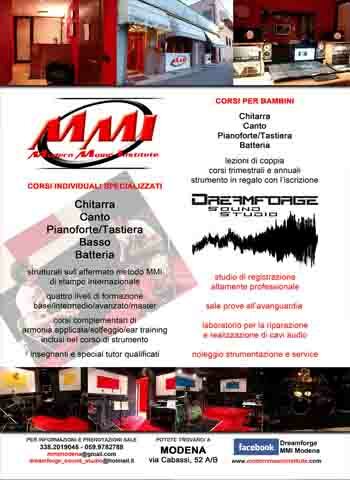 – organization of clinics and master classes. Now he’s teaching activity concerns Basic, Intermediate, Advanced, Master level Courses, Professional and Bachelor Courses, Reading Courses of the whole levels and the Teachers Educational Courses in the MMI schools of Verona, Modena and Padova. 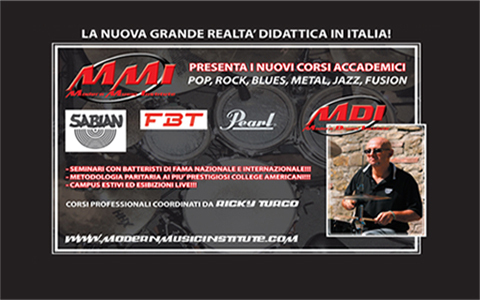 Attualmente conduce i Corsi di livello Base, Intermedio, Avanzato e Diploma, i Corsi di Lettura Ritmica di tutti i livelli, i Corsi Professionali Master e Bachelor e i Corsi Insegnanti presso le sedi del Modern Music Institute di Verona, Modena e Padova.